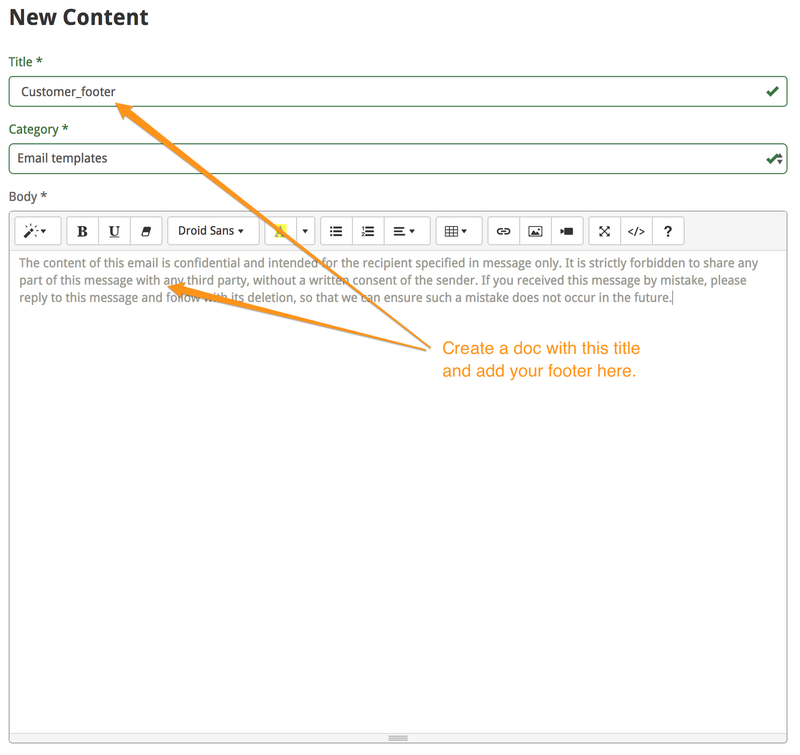 Helpy gives you three ways to customize the formatting of emails sent to your customers. Emails are sent at several times during your interaction with customers- such as when you start a conversation with them, when you reply to a ticket received from the customer, or an automatically sent reply from a trigger. Individual agents can create a signature that will be automatically appended to the bottom of messages they send, or your can create a header or footer to be applied to all messages sent from your account. You are able to customize this to suit your needs in a number of ways described above. go to the upper right avatar menu, and select "profile", when logged into the agent portal. Scroll to the bottom and use the html editor to create your signature. Click save. It is possible to add a custom header or footer to every email sent to your customers. This makes it possible to create your own template by adding code, css formatting and other elements to your messages. 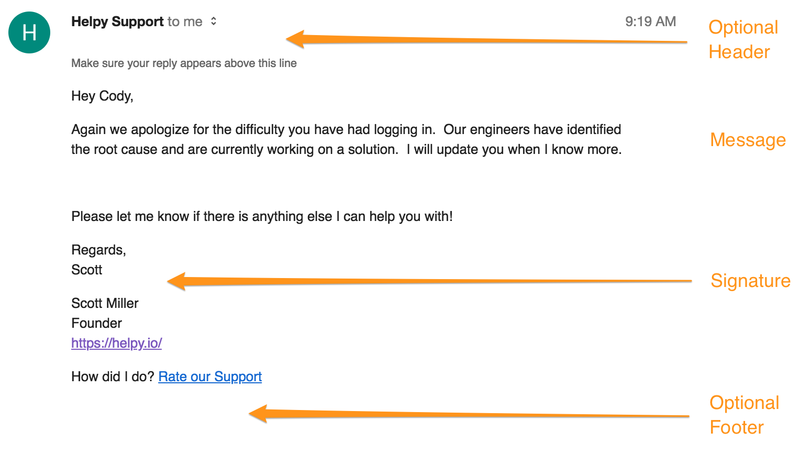 Note: custom header and footer elements only affect messages sent to customers. Notification emails that agents and admins receive will continue to use a system designed email template. Navigate to "Helpcenter > Content". Locate the category "Email templates." It is possible that this category also says "not implemented". If your Helpy does not have the "not implemented" text, skip to step 5. If it says "not implemented" begin by editing the category to remove that part of the description. Next Create two new docs in this category, named "Customer_header" and "Customer_footer". To edit the header, open the doc named "Customer_header" and add any text, images, elements or html you wish to include in the header. To edit the footer, open the doc named "Customer_footer" and add any text, images, elements or html you wish to include in the footer. Click "New Ticket" and send yourself a new ticket to test your new header/footer.